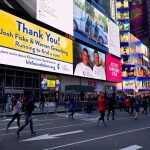 KLS makes its first Times Square debut! A big Thank you to Josh Fiske & Warren Greenberg for raising funds for research! KLS makes its first Times Square debut! Together wearing their KLS t-shirts proudly, this past Sunday (3/18/18) Josh Fiske & Warren Greenberg ran in the United Airlines NYC Half Marathon. 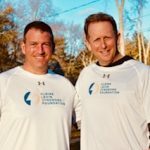 Both men ran to raise awareness and funds for KLS research. The sense of pride both men felt, as they pounder the pavement was overwhelming in the best of ways. Knowing every bit of blood, sweat and tears was for an amazing cause, gave them the strength to keep going when exhaustion set in. Because of their incredibly kind gesture, the foundation will be receiving a check in the amount of $5,296. 100% of this money raised, will be used towards research. Gary, Jenny, Coop, and Charlie are forever grateful to Josh and Warren, our family and friends, that helped make this generous donation possible. Because of their continuous support, we will not stop spreading awareness & raising funds for research and ultimately finding a cure!